and the then top secret Woomera Rocket Range, South Australia between 1956-1976. Following the end of WWII when Britiish Empire sentiment was high, the Australian Government agreed to a high level British Government request to use Australian remote sites for rocket and weapons testing. First site selected was for a rocket range in the South Australian desert 400 miles north of the state capital city Adelaide. It was named Woomera, after an aboriginal spear throwing implement. Work began in 1947 on a high-security military base, airfield and village which would house up 7,000 Australian and British scientists, airmen and servicemen with their families. A rocket firing range was prepared over many hundreds of miles stretching from Woomera into the Tanami Desert in Western Australia. In 1952 Britain detonated its first atomic bomb in the Monte Bello Islands group off Onslow WA. The following year two more British atomic bombs were detonated at the top of 200 feet towers at Emu Claypan in the SA desert. The Emu test site and village was abandoned when it was contaminated by the radioactive cloud of the second test. A new atomic testing site was established 100 miles to the south and given the name Maralinga where a series of atomic devices were detonated on the ground and dropped from RAF Valiants until 1960. All this military weapons development was overseen by the Long Range Weapons Establishment. In January 1955 LRWE was reformed as Weapons Research Establishment based at Salisbury on the northern outskirts of Adelaide on a site where a new military airfield was being constructed. 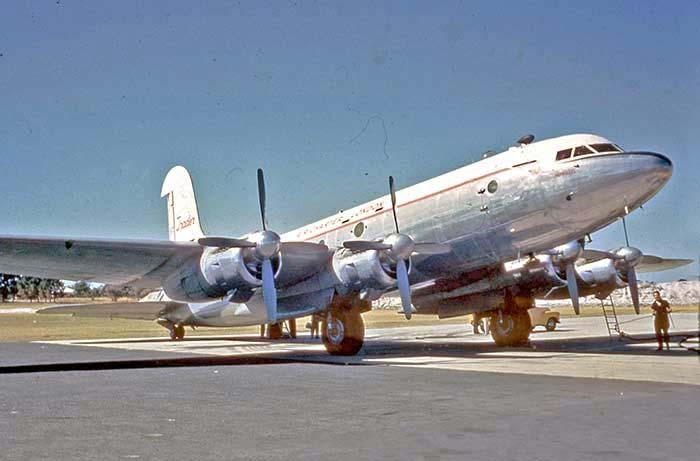 Named RAAF Edinburgh, its initial role was to support the RAAF and RAF activities activities at Woomera and Maralinga, including target drone Meteors and Canberras. 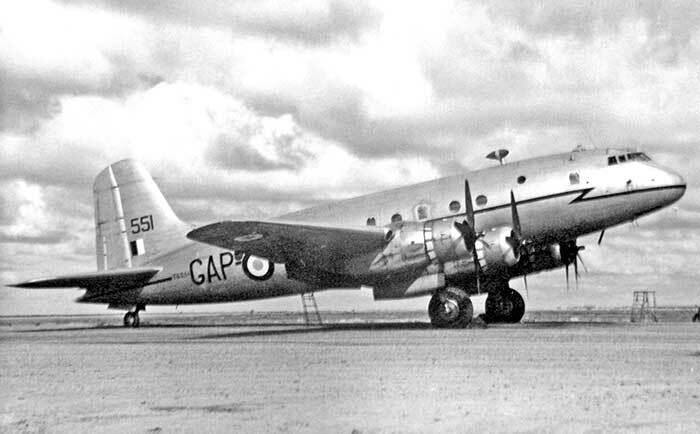 A RAAF courier service between Woomera and Adelaide carried high clearance security personnel and equipment using C-47s, Bristol Freighters, Percival Princes and in the early days a Vickers Viking. 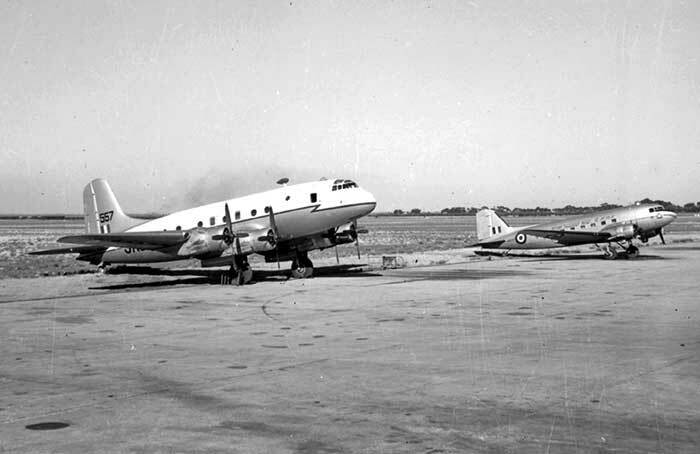 The Adelaide base for the Woomera courier flights was RAAF Mallala, moving during 1956 to the newly built RAAF Edinburgh. 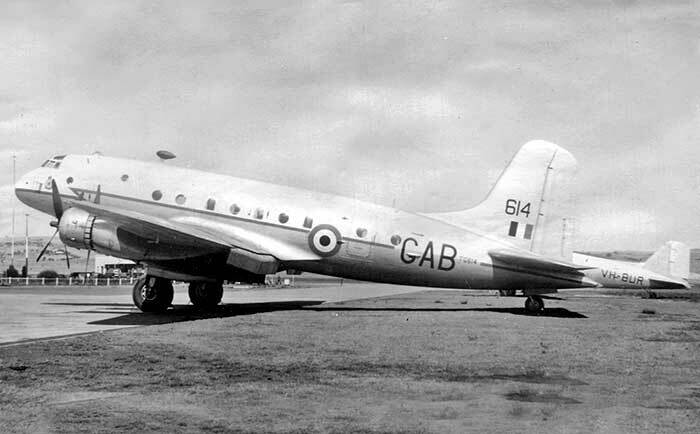 A regular British military courier service was operated between Britain and Woomera and LRWE Adelaide using RAF Handley Page Hastings transports. Hastings TG614 at Adelaide-Parafield in April 1952, parked outside the DAP military maintenance hangars. 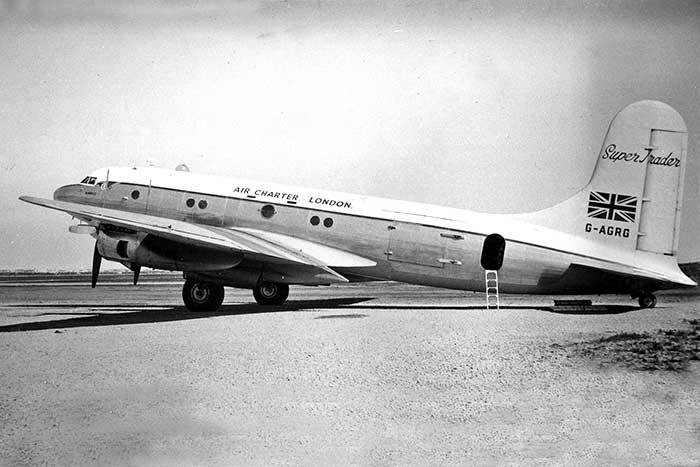 During 1955 as activities at Woomera and Maralinga increased, the British Ministry of Defence routinely used British charter airlines to supplement the military courier services between Britain and Woomera. These appear to have been ad hoc charters at first, operated by Dan-Air, Skyways and Britavia, before a formal long-term contract was awarded in 1956 to Freddie Laker's Air Charter Ltd, London. This required a scheduled weekly return service from London to Woomera and Adelaide carrying Ministry freight and security-clearance approved passengers. For reasons not readily apparent, these civil airliners on the Britain-Woomera-Adelaide courier used Adelaide Airport rather than the much more logical LRWE HQ at the new RAAF Edinburgh 10 miles away. Instead of having the operation hidden away behind Edinburgh's high security, instead Adelaide aviation ethusiasts were treated to the weekend British courier visits and the sounds of Merlins crackling and back-firing as power was pulled back on the Air Charter Tudors landing at Adelaide Airport, followed by squealing brake drums as they taxied in, chatting with friendly air crew while officious Commonwealth Policemen bustled around shouting threats at anyone with a camera or coming too close to the top secret cargo, even if it was the WRE passengers' suitcases. Then came the memorable departure with four Merlins bellowing at full power, usually off Runway 23 to allow a long slow climb out over the water of St Vincent Gulf. Skyways Ltd Avro York G-AGNY in 1956 with the Adelaide terminal building under construction behind. 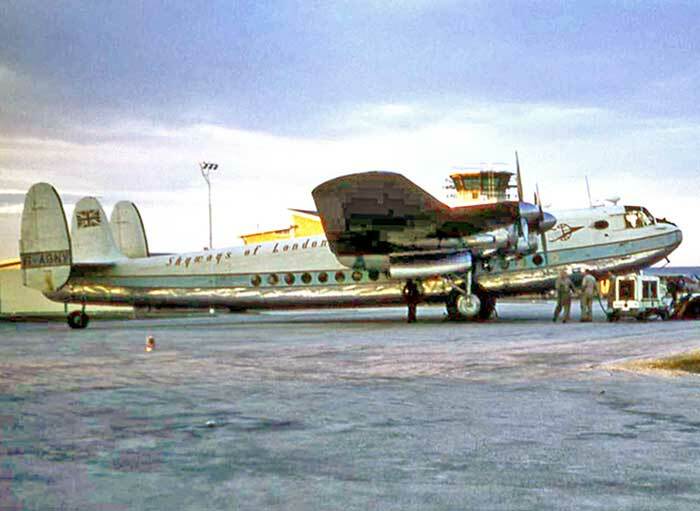 Dan-Air Avro Yorks were seen at Adelaide circa 1956 on the the UK-Woomera courier service. 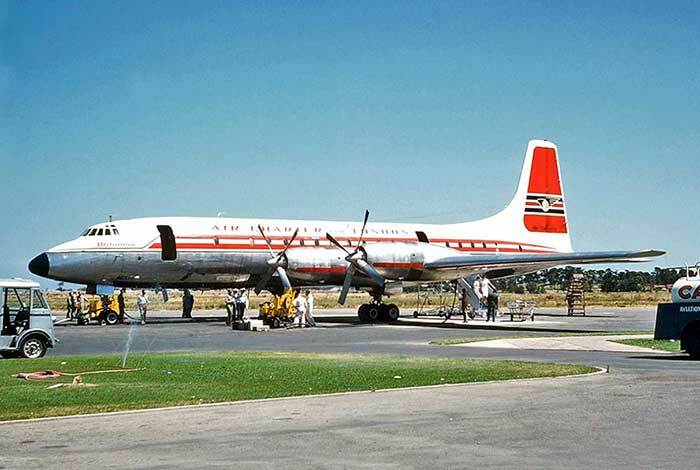 G-ANTJ is seen later in 1959 at Adelaide Airport when assumed to be cross-hired by Air Charter Ltd.
Britavia Handley Page Hermes G-ALDI at Adelaide circa 1956. Cleaned cabin carpet is hanging out to dry. Formed at Southend in 1947 by British business entrepreneur F.A. "Freddie" Laker as the first of his many aviation operations. 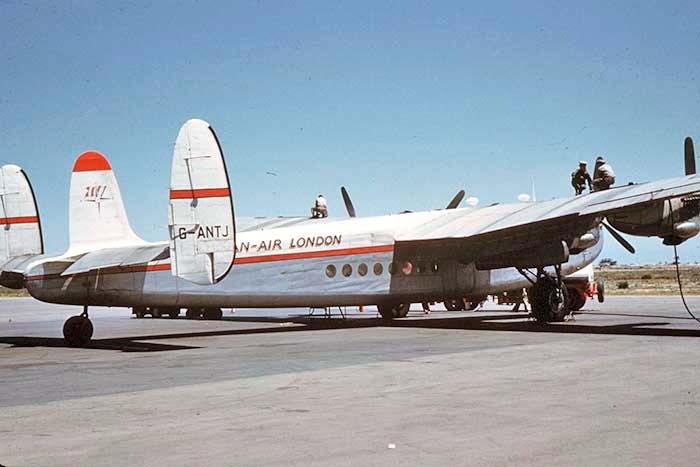 Avro Yorks and Bristol Freighters were used on freight charters in Europe and long-range "trooping"charters carrying British military personnel to bases across the Empire. 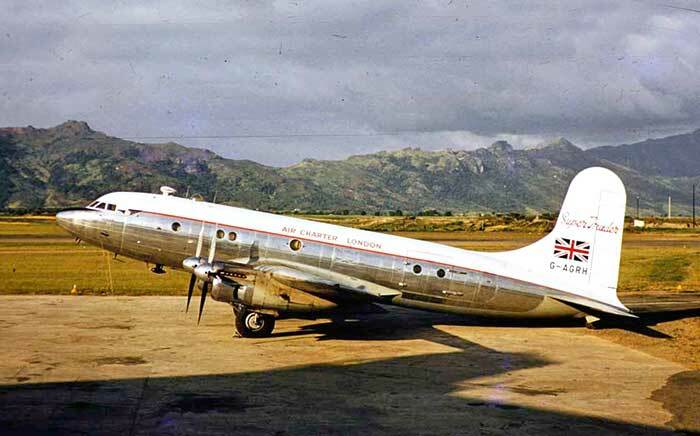 After the Avro Tudor had been rejected by BOAC and retired by other operators, Laker purchased every available Tudor and with his heavy maintenance company Aviation Traders Ltd devised modifications to turn the unloved Tudor into an effective air transport. Among the Tudors acquired were four Mk.4s which had the front fuselage lengthened by 6 feet (1.8 metres). Aviation Traders rebuilt two other short fuselage models with the extended fuselage. The six were rebuilt by ATL with uprated RR Merlin 623 engines, re-routed hydraulic and pneumatic lines, Shackleton type wheels and a large 6ft 10 inch wide rear cargo door. All pressurisation equipment was removed. Laker named these six modified stretched Tudors Super Traders. The model received British type certification in March 1955 as Tudor Mk.4B with a significant increase in All Up Weight to allow an extra three tons of payload. The standard route to Australia was first leg Stansted-Brindisi, Italy then via Turkey, India, Singapore, Darwin to Woomera. The weekly schedule required the aircraft to arrive at Adelaide Airport late Saturday afternoon for a night-stop. Maintenance was carried out by the aircraft's Flight Engineer with assistance from Trans-Australia Airlines which was contracted for ground-handling the Adelaide turn-around. Adelaide freight would be loaded and the aircraft prepared for the long haul back to London. Sunday afternoon boarding of security-cleared passengers and their families took place though a small passenger terminal in the side of the ANA hangar. This temporary terminal was used for ANA and Guinea Airways services prior to the new Adelaide Airport terminal building being completed in August 1957. When the new terminal took over, the disused ANA (now Ansett-ANA) hangar passenger room was retained for a period solely for the Woomera courier flights, probably to maintain the Governmental secrecy associated with all the British military activities in Australia. In addition to the scheduled courier, Air Charter Tudors flew additional charters to Woomera carrying dismantled rockets and equipment. For operational reasons some Tudor flights to Woomera were routed via North America, Hawaii and Fiji. The Tudors also gained much work in connection with the British H Bomb tests at Christmas Island in the Pacific south of Hawaii. 27 January 1959 G-AGRG crashed on takeoff Brindisi, Italy and destroyed by fire. During the takeoff roll the aircraft veered to the edge of the runway in a strong crosswind. The port undercarriage was torn off by rough terrain on the runway edge and fire broke out. Captain and First Officer died, the 4 other crew survived. No passengers. 23 April 1959: G-AGRH struck Mount Suphan near the Turkey-Armenia border at 13,000 feet elevation and was destroyed. The Tudor which had departed Ankara for Bahrein carrying top secret missile sections bound for Woomera, drifted north of the flight planned track which would clear the mountains. The wreckage was sighted 6 days later and a RAF team urgently despatched by helicopter from Cyprus. After confirming there were no survivors among the 12 occupants, the team collected documents and items from the wreckage before using explosives carried into the site to demolish the remaining cargo items. There was unproven suspicion that Soviets in Armenia had activated a decoy NDB radio navigation aid to guide the aircraft into high terrain. There was also speculation that the secret cargo included a nuclear device and rumour had it that local villagers who heard the crash and looted the wreckage and deceased before the RAF arrived, suffered from exposure to radiation and abnormally high cancer rates. The Tudors sometimes took a southern route across the Indian ocean via Colombo, Cocos Island and Perth. Here G-AHNL receives a hosing down at Perth Airport on Boxing Day 1958. 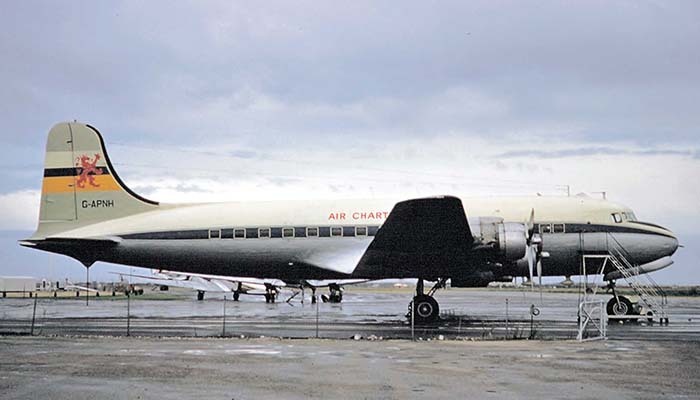 Air Charter Ltd was introducing Douglas DC-4s and Bristol Britannias into its general charter fleet. First to visit Adelaide was the colourful Britannia G-ANCE on 8 February 1959 bringing 100 British servicemen. This was additional to the Woomera courier, the Britannia continuing to Sydney then to the British H Bomb test site Christmas Island in the Pacific Ocean to collect its next Ministry of Defence load. 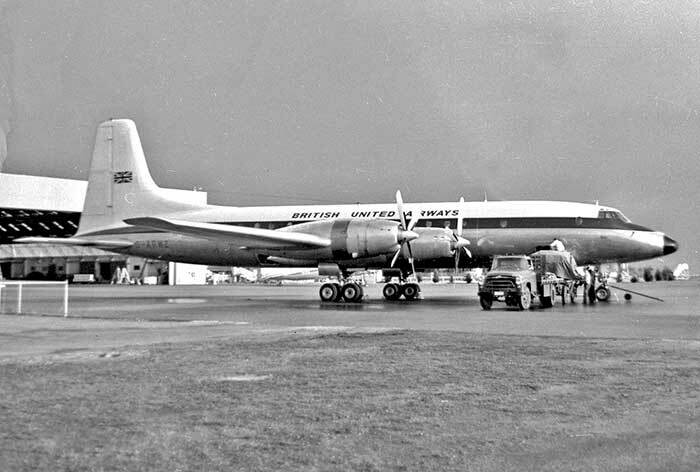 Air Charter's first Bristol Britannia G-ANCE brought 100 British servicemen to Adelaide on 8 February 1959. 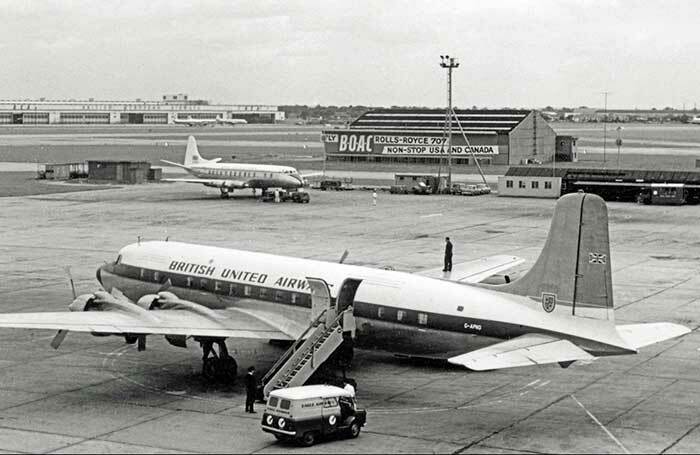 In June 1960 eight British independent airlines including Air Charter Ltd agreed to merge to form a new larger operation named British United Airways. Air Charter's Managing Director Freddie Laker became Managing Director of BUA. 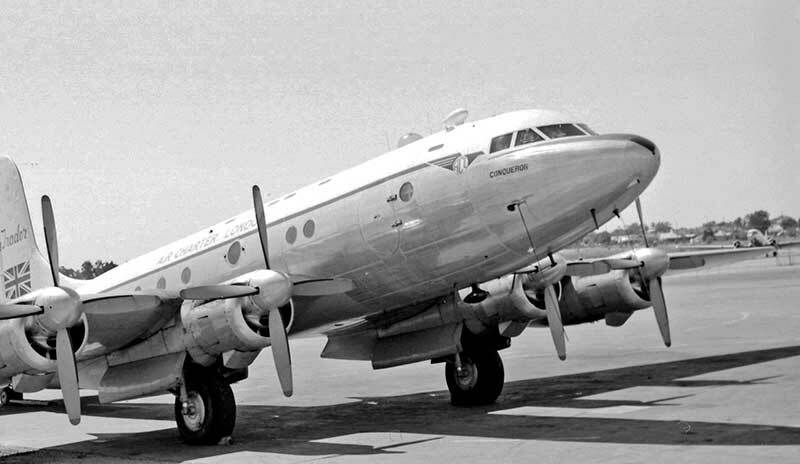 The Woomera courier contract was transferred to BUA and continued with the same DC-4s and Britannias repainted in BUA markings. 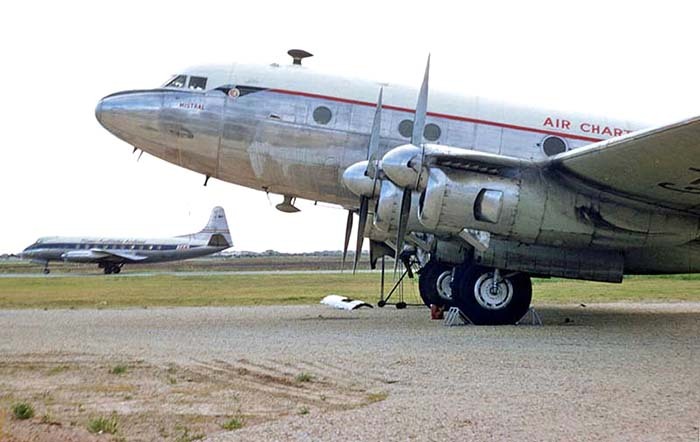 Additionally two BUA DC-6As were used G-APNO and G-APNP. Air Charter Ltd merged into the new British United Airways in June 1960. BUA took over the Woomera run. BUA DC-6A at London-Heathrow 20 August 1960 during the period it was used on the Woomera contract. During the BUA period on the contract, Australian built Government Aircraft Factories GAF Jindivik radio controlled target drones for the RAF were added to the Adelaide WRE freight loaded for Britain. These new drones were painted white with RAF markings but RAAF A92- series serial numbers, packed in open sided crates and brought by road from GAF in Victoria. At Adelaide Airport they were stacked in the TAA hangar waiting for the weekend courier flight, with casual access to photograph and check serials. However during loading on the courier aircraft, the crates were covered and stern-faced Commonwealth Police surrounded the aircraft to protect the Jindiviks from public sight. 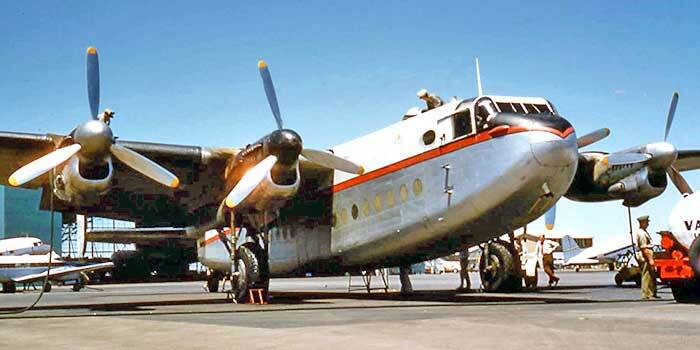 A typical loading was noted on 7 April 1962 when dismantled Jindiviks A92-248 and A92-249 were taken on board BUA DC-4 G-APNH which departed several hours later for Britain. Jindivik airfreight deliveries continued for several years. 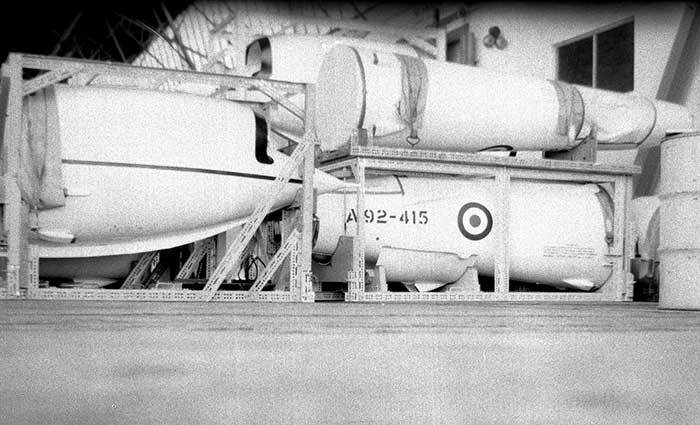 Crated RAF Jindiviks in the open doorway of the Adelaide Airport TAA hangar in November 1962. 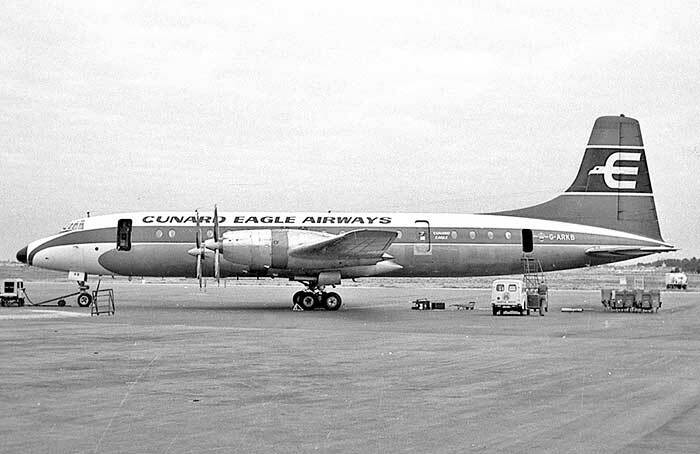 Effective June 1962 British charter company Cunard Eagle Airways Ltd won the Ministry tender for the next two years of the courier service to Woomera and Adelaide. This was a revised contract specifying up to 3 return services per week to Woomera to cater for a peak in British weapons and missile trials. Not all courier runs were required to continue to Adelaide. It was a big undertaking by Eagle Airways, which already had British "trooping" contracts carrying servicemen and their families between postings in Middle East, Singapore and Hong Kong. 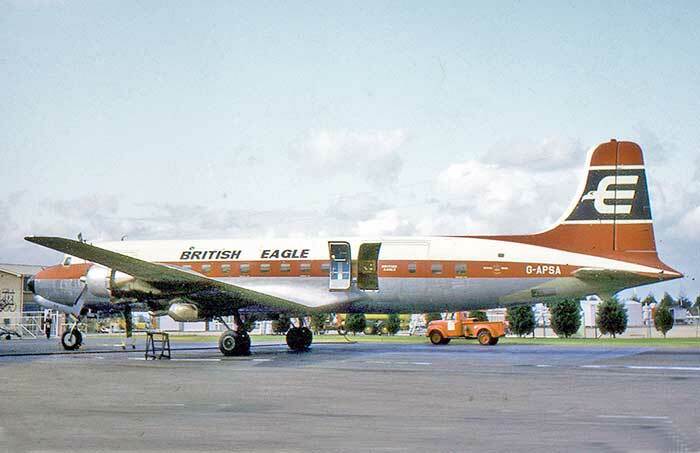 Eagle tendered for Woomera with mixed passenger/freight Douglas DC-6As, supplemented by turboprop Bristol Britannias which were on order. 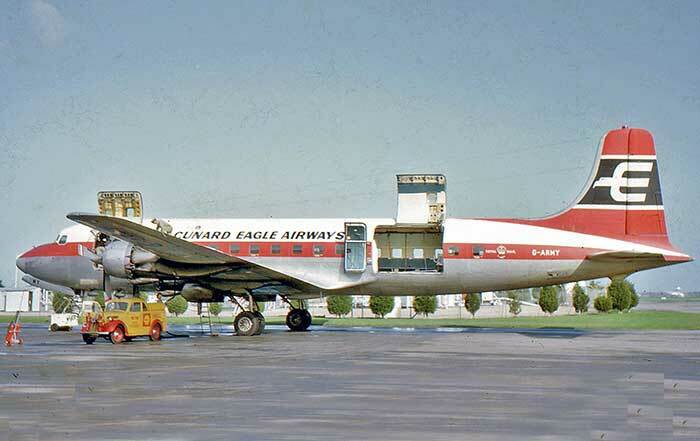 Established in 1948 as Eagle Airways Ltd by 25 year old Harold Bamberg to operate Halifax freighters on the Berlin Airlift, Eagle became one of the leading British independent airlines with worldwide operations. 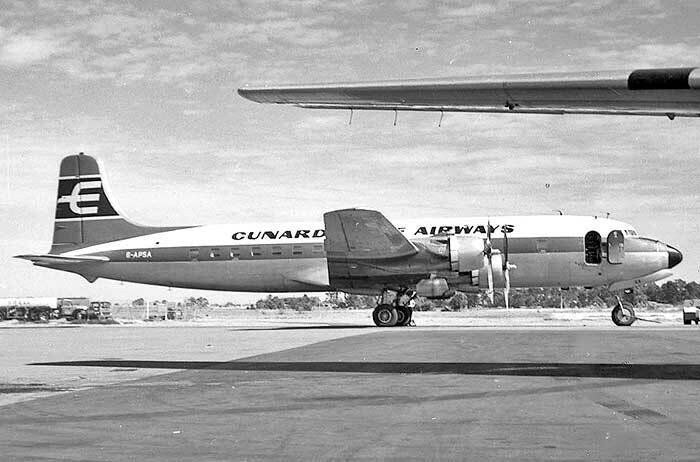 In March 1960 the Cunard Steamship Company acquired a controlling financial interest and the name wa changed to Cunard Eagle Airways. 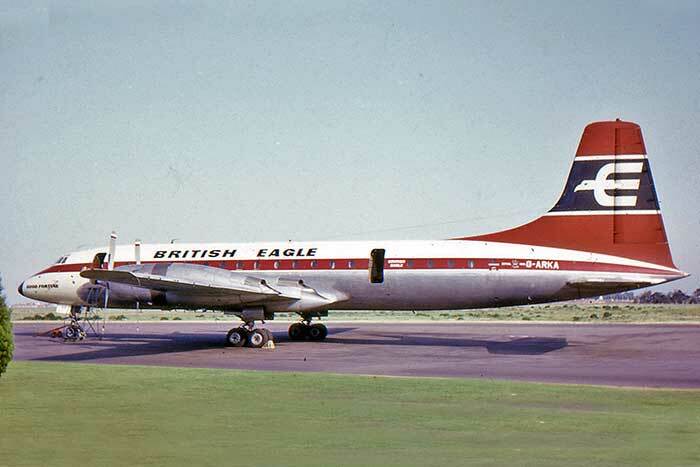 After a tumultuous partnership Harold Bamberg regained financial control in February 1963 and in August that year changed the name to British Eagle Airways. 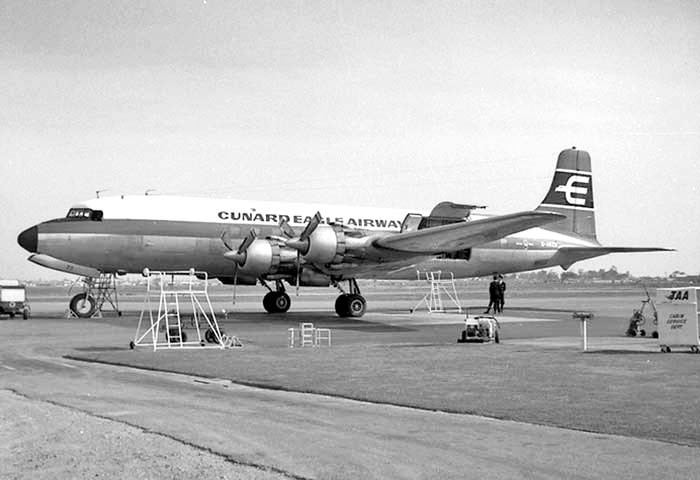 The inaugural Cunard Eagle Airways service to Woomera departed London-Heathrow on 8 June 1962 flown by DC-6A G-ARZO. Their gleaming red DC-6s quickly became regular visitors at Adelaide Airport. 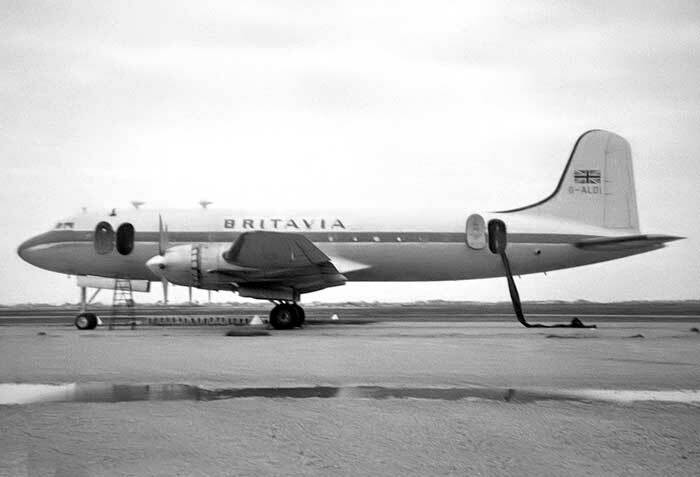 The first service by the promised Britannias came on 7 October 1963 when G-ARKA Good Fortune arrived from London and Woomera. 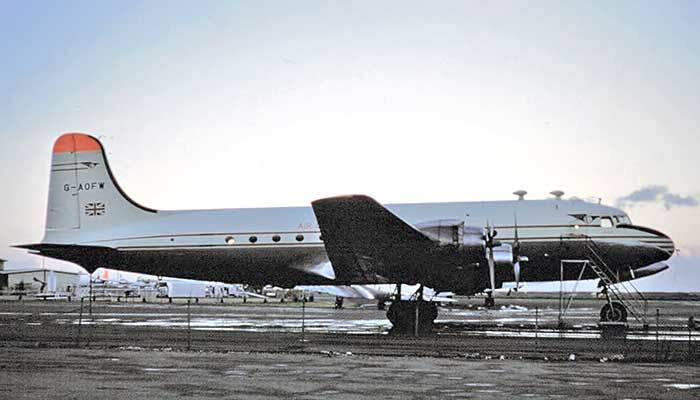 It and sister G-ARKB Endeavour replaced the DC-6s by early 1964, giving much reduced flight times but lacking cargo doors. 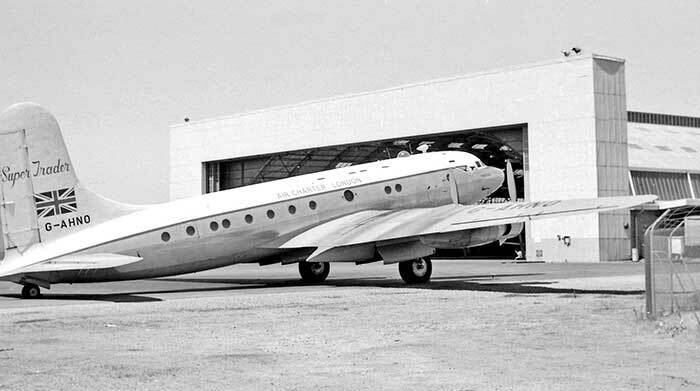 This was solved in typical Bamberg fashion by purchasing two early model Britannias from an Argentina airline and having large freight doors cut into the forward port fuselage. This pair G-ANCF New Frontier and G-ANCG Trojan operated the majority of British Eagle Airways' renewed contracts on the Adelaide courier. G-ANCG was lost 20 April 1967 soon after departing Heathrow on an Adelaide service with 11 Crew and 54 passengers. The undercarriage retraction system failed leaving the left bogie extended at an incorrect aligment. Captain Don Chubb was diverted to RAF Manston for an emergency landing on a foamed runway. There were no injuries but the aircraft was written off. 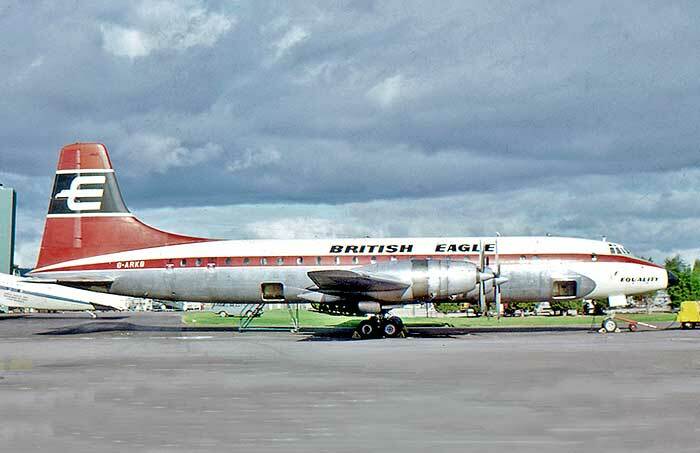 During 1968 a series of commercial and financial problems resulted in the British Eagle, which had 2,300 employees at the time, being forced to cease operations on 6 November 1968. Their last service on the Australian courier was flown by Britannia G-ANCF which departed Heathrow on 31 October 1968 and reached Adelaide on 2 November. It arrived back at Heathrow on 5 November, the day before the airline shut down. DC-6A G-ARZO awaits loading on the TAA apron at the Adelaide Airport terminal in September 1962. The name change from Cunard Eagle to British Eagle is shown in these two colour photos taken by John Smith. Both at Adelaide, G-ARMY above July 1963, G-APSA below in December 1963. The Cunard Eagle DC-6s were supplemented then replaced by Bristol Britannias. G-ARKA "Good Fortune" above in October 1963, below G-ARKB "Equality" in July 1966. Monarch Airlines Ltd was a new-start operation started in June 1967 by a British travel group to carry its inclusive-tour holiday makers to European destinations. Long distance charter contracts were actively sought to keep its Bristol Britannias busy outside summer holiday seasons. With the collapse of British Eagle Airways in November that year, Monarch successfully bid to take over the Air Ministry courier service to Australia. 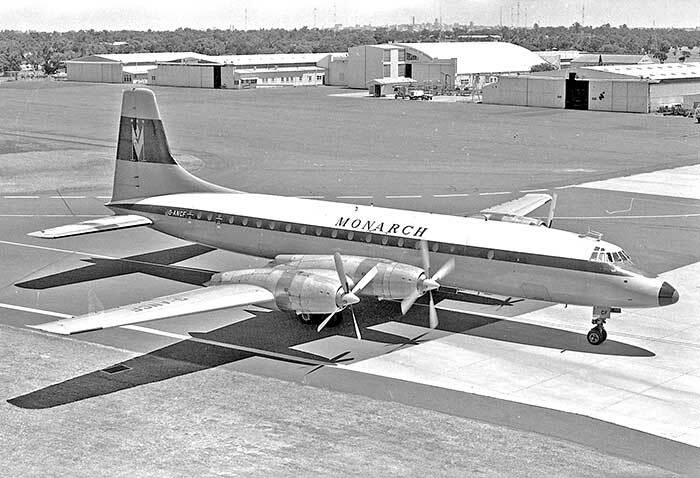 Monarch Airlines' first Australian service was flown by Britannia G-ANCH arriving at Adelaide Airport 21 Novemnber 1968. The bright yellow Monarch Britannias became a regular sight at Adelaide, usually G-ANCE, G-ANCF, G-AOVH or G-AOVT. For political and operational reasons (adverse upper winds), the Monarch Britannias routinely routed clear of Indonesian airspace by crossing the Indian Ocean to the south via RAF Gan in the Maldives, Cocos Island and Perth. During February-March 1973, G-ANCE and G-ANCF were chartered by Trans-Australia Airlines to join an relief airlift of food and supplies to Alice Springs NT which was isolated by inland floods. British defence research and testing activities at Woomera, Maralinga and WRE Salisbury were wound down during the early 1970s and the frequency of the courier service reduced. Consequently, during 1975 the British Defence Ministry determined the need for the high security Australian courier no longer existed. The final service departed Adelaide Airport on 15 December 1975 when Monarch Airlines Britannia G-ANCF climbed out over the Gulf bound for London. Britannia G-ANCF makes a refuelling stop at Perth, Western Australia in April 1974 on the Woomera courier. The Tudor Super Trader arrival from Woomera on Saturday evenings or more often running late on Sunday mornings was announced by the distinctive sound of Merlins crackling and popping as power was pulled back coming over the fence. I would hear this from my home on the airport boundary, giving me time to ride my bicycle to the ANA hangar. There I would enjoy the sights and sounds as the mighty Tudor slowly taxied in from the other side of the world, with snarling Merlins and squealing brakes. The WRE boffins would disembark, weary from their long journey, wearing heavy coats and clothing despite the Australian summer heat. Officious Commonwealth Policemen fussed about, shouting dire warnings to anyone with a camera, for no obvous reason. The aircraft cargo doors remained firmly shut until everyone had left. When the passengers and officials had departed by bus to WRE at Salisbury, the Tudor's crew would give the aeroplane a close inspection. I recall listening to good-natured banter that the Flight Engineer wouldn't be getting much sleep that night while he fixed the list of snags before their departure next day. I would take this opportunity to ask the Air Charter crew members to sign my Observers Book of Aeroplanes - they unfailingly obliged and courteously chattered with a wide-eyed schoolboy. I was given a look inside the rear passenger end of the cabin with rearward facing seats and had my first lessons on aircrew ranks and titles. Sunday afternoon departures had a cheerful feel because most of the passengers were Englishmen and their families going home after attachments at WRE. The original terminal room in the side of the ANA hangar was quite small and there was a crush of passengers, WRE officials and stern-faced men in suits who were probably some kind of security. Airline staff were checking in vast amounts of personal baggage. Additional Commonwealth Policemen were on hand barking warnings to all and sundry but even a 10-year-old could see they really didn't know what they were protecting. It was the height of the Cold War and everything to do with Woomera was top secret. The DCA airport safety officer would be watching procedings from his yellow Holden panel van. After all, back then this was these were the only International aircraft to regularly use Adelaide Airport.